The cannabis industry offers fertile territory to explore the relationship between education level and job placement. Recent legalization efforts have been won in the face of active stigma and by their very nature subvert traditional American business trends. As young, college educated job candidates apply for the same jobs as former black-market cannabis growers, just how much does a college degree matter in the cannabusiness? With a spike in revenue from 2015 to 2016 resulting in $6.7 billion for the North American market, everyone is looking to get in on the green. Legal cannabis dispensaries are a microcosm of the industry as a whole. Like other retail-driven businesses, there is a clear hierarchy established between the entry-level, management and ownership factions of the business. While each position interacts with others, individual salaries and responsibilities reflect a hard line in the sand between job descriptions. Budtenders, recognized as the attentive cannabis specialists found behind dispensary counters, are considered entry level employees; you wouldn’t guess based on how active a role they take in the business. Budtenders do much more than facilitate checkout — these savvy employees are chock full of wisdom to help you find the right kind of product to fit your tolerance level and desires as a consumer. Knowing just how important it is to comply perfectly with new industry regulations, dispensary hiring managers consider job applicants they believe they can trust. Search any generalized marijuana jobs website, or a more niche one, and you will see employers looking for experienced budtenders who have previously worked hands-on with cannabis. This is an effort on behalf of businesses to hire those with proven stock in the industry. The other essential trait of a budtender is proficiency in customer service. As such, a lack of cannabusiness experience can be made up for by having worked as a barista or bartender. With these criteria in mind, having a degree is rarely, if ever, required to work as a budtender. While having a degree won’t be a detriment to your application, it may not have as much allure as it would in other industries. Hourly wages for budtenders are commensurate with other entry level pursuits, averaging around $13. If budtenders have a lot of responsibilities, the same can be said and then some for those who work as a dispensary manager. These individuals not only oversee daily store operations, but are tasked with hiring and training employees, among a host of other responsibilities. Similarly to budtenders, managers are selected based on their potential to be a leader in a team environment, rather on their academic credentials. With that said, the cannabis industry is providing a home for motivated candidates looking to apply their studies to the world of weed. While you don’t have to be a cannabis consumer to manage a dispensary, you’d be hard pressed to find anyone behind the counter that isn’t a steadfast supporter of the skunky stuff. Salaries for dispensary managers are more competitive than budtenders, reaching hourly wages of $25. The cannabis industry is a ripe one for entrepreneurs. NerdWallet recently compiled their 5 Best Industries for Starting a Business in 2017. The data were formed based on information from the U.S. Bureau of Labor Statistics, among other market research surveys. Ultimately, marijuana was placed second on the list for its incredible potential as a novel industry with plenty of room for growth. There aren’t any hard and fast education requirements to own a dispensary. Largely, the entrepreneurs experiencing the most success running legal pot shops come from diverse backgrounds. The only real qualifications to open a business is to achieve a license and have enough capital to comply with the many regulations associated with getting a dispensary up and running. Even with a license and the government go-ahead, it’s an arduous process to navigate through the convoluted legislature, in order to open the store doors. Most dispensary owners either come from cannabis industry backgrounds, or have owned other businesses and can sidestep some of the hurdles that might catch newcomers. As much as this industry allows for virtually anyone to pursue their piece of the pie, it is becoming extremely competitive. For most people interested in working in dispensaries, the goal will be to apply, interview and accept a job as an entry level worker or manager. As somewhat of an “embed” in Portland, Oregon’s legal cannabusiness, I weekly observe the trends in job postings by dispensaries throughout the metropolitan area. My findings (though anecdotal) have shown what appears to be a larger trend in this exciting industry that competition, even for jobs with low wages, is staggering. Following over a dozen budtender/dispensary receptionist jobs on Indeed.com for a week, I found that each post received over 100 applications within 72 hours. Every time. The hourly wages for these jobs ranged between $10-15 (including tips). Since employers have dozens of options when it comes to candidates, they now have the privilege of interviewing and hiring only the most qualified individuals for their company. This is why having a Bachelor Degree, for instance is less of a focus than knowing your way around a nug. As public and private education prices continue to soar, the cannabusiness offers opportunities for driven, intelligent individuals to find fulfilling work, without incurring unnecessary debt. Other Cannabusiness Sectors: Is a Degree Necessary? 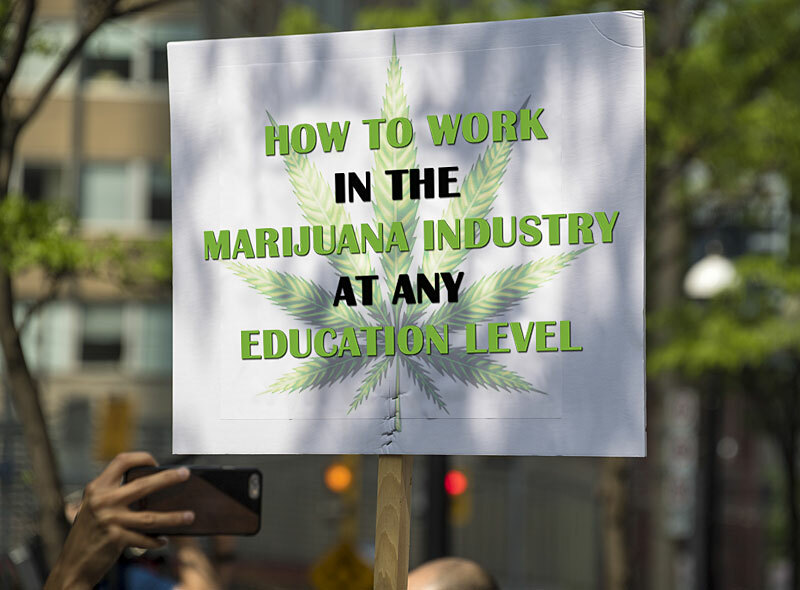 On the contrary, when it comes to more advanced positions in this industry, such as leading a legal grow operation or working as a cannabis extraction technician, advanced degrees may be necessary. Not all leadership positions demand that candidates have a university education, however, there are certain skills that a college education can lend itself to developing. The cannabis industry is expected to grow an additional 33.5% over the next five years. What is fascinating about the legal business is that it is growing and changing at this very moment. The future of comprehensive legalization countrywide is unclear, but the current climate of state operations suggest greener pastures for a wide range of candidates with different levels of education.